Beat the eggs with vanilla sugar and cinnamon. Add other ingredients and mix well with a whisk or electric mixer. Sprinkle a little bit of oil in a frying pan and when it gets hot pour a small amount of the mixture to get pancakes with a diameter of about 10 cm. When they're done on one side (they will rise a bit), turn them and cook on the other side, for about 30 seconds. Put the blackberries with all the ingredients in a saucepan and cook on low heat until soft and until the sugar and starch are dissolved. 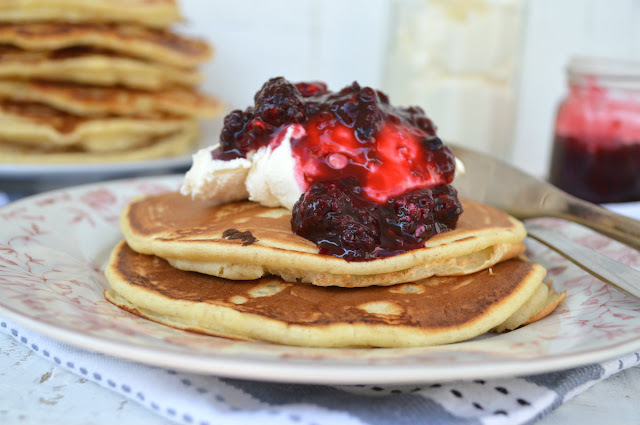 Spread a spoon of mascarpone cheese on each pancake and sprinkle with blackberry sauce. Bon appetit!